The $115 million renovation and expansion of the Royal Hawaiian Shopping Center in Waikiki wrapped up yesterday with a weeklong celebration featuring performances, discounts and special products. The more than two-year project was the first major renovation to the center since it opened in 1979. The four-level center has been expanded from 290,000 to 310,000 square feet, and has 110 shops and 10 anchor restaurants, and starting in mid-July will have a showroom that will change into a nightclub called Level 4. Stores include 7 for All Mankind, bebe, Bvlgari and Juicy Couture, with restaurants such as P.F. Chang's, The Cheesecake Factory and Wolfgang's Steakhouse. The center is the largest asset owned by Kamehameha Schools. Hawaii's average regular gas prices hit another record high this week, reaching $4.34 a gallon Thursday, and remaining steady through yesterday. 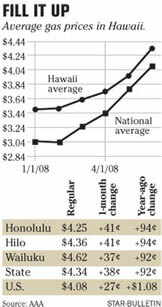 Wailuku had higher gas prices than Honolulu and Hilo, the three isle cities tracked by AAA. Wailuku posted an average of $4.63, with Hilo following at $4.36 and Honolulu at $4.25, all jumping nearly a dollar from last year. 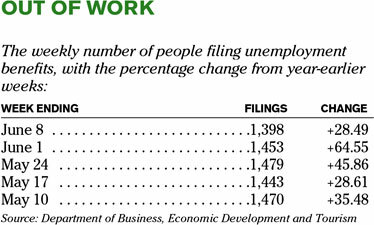 The national average was $4.08, also hitting a high this week, up from $3 a year ago. Diesel averaged an all-time high of $4.79, up from $2.90 last year. Hoku Scientific Inc. said yesterday it has partnered with Great Western Malting Co. to reuse waste heat in the form of process water from Hoku's planned polysilicon manufacturing plant. The Kapolei-based alternative energy developer said yesterday it will supply heated water to Great Western, which operates a malting facility on land adjacent to the land leased by Hoku for its planned polysilicon plant in Pocatello, Idaho. Great Western, a byproduct of polysilicon manufacturing, will use the water as an indirect heat source in its malt production line and then return the cooled water to Hoku for reuse. This process will reduce natural gas requirements and provide Hoku with a lower-cost option to cool and recycle its process water, Hoku said. Grace Pacific Corp., one of the state's largest kamaaina-owned construction companies and its largest asphalt paving contractor, said yesterday that President and Chief Executive Robert Wilkinson will retire on Sept. 30. He will be replaced immediately by David Hulihee, chairman of Grace Pacific's board of directors and president of Royal Contracting. Wilkinson, who has been with Grace Pacific since 2001, said his tenure with Grace has been "the highlight of my 45-year career." Wilkinson will continue to serve as the company's president until his official retirement in September. Grace Pacific has about 550 employees and an 88-year history of serving the Islands. Lawrence Yun, chief economist and senior vice president of research for the National Association of Realtors, will be the keynote speaker July 17 at the Honolulu Board of Realtors' July brokers forum. Yun, who has been the chief forecaster for the national organization for several years, pioneered the commercial leading index after helping develop the residential pending home sales index. The forum, scheduled from 9:30 a.m. to noon at the Hawaii Convention Center, is open to all Realtor members. Registration is being taken online at www.HiCentral.com/register or at 732-3000. ALL CLEAR: The Supreme Court of Canada has ruled that the $35 billion leveraged buyout of BCE Inc.- the largest leveraged buyout in history - can go ahead. BCE is Canada's largest communications company.